Back and forth to the hospital all week. Driving Jules. She is staying in her mother’s house, her childhood home, trying to come to terms with finding remnants of the girl she was all over the place. A hairclip made in France in the bathroom cabinet, old but free of dust. She used to pull her hair to the side and pretend her name was Juliette. The clip has poppies on it – purple, blue and white. A doll is there. A porcelain face with a Victorian-style dress and a bonnet. The hair is soft, like real hair, as if the doll used to be human. The little eyes follow me around the room. 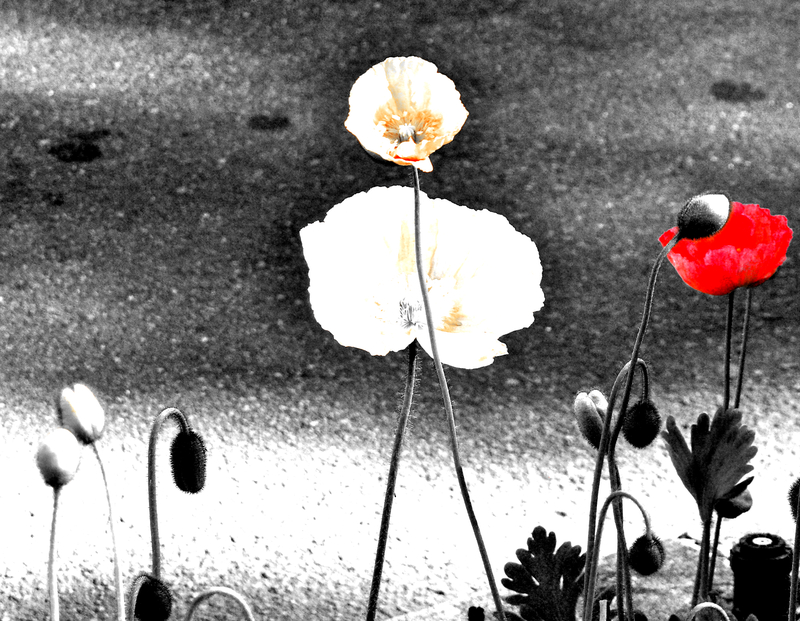 In the garden Jules’ mother’s poppies grow, standing like an ensemble of dancers, swaying slightly in the wind. They are yellow and orange and white, cheerier than I expected. Jules is reading to her mother. It is easier than forcing her to talk. She has lost the power of recognisable speech. It is like watching a songbird writhe on the ground as its music is plucked from its throat. The book is one of mine. Wuthering Heights. One of my favourites and one of Jules’ mother’s too. I never knew it. It has left an odd feeling in my heart that she and I should love the same thing. I don’t know if it’s good or bad but I wish she had wanted something different. I am not entirely comfortable with her thinking of Cathy and Heathcliff. Imagining them and the moors. People are all over the hospital. Mostly quiet. Mostly waiting. Sometimes the best way to deal with pain and suffering is silence. The waiting helps too once you get used to it, it pulls a strange type of patience out of you. There are poppies in the hospital flower beds. Red and white. I wonder why I am being followed around by poppies and books that mean something to me and also to someone else. Someone I never thought would care about such things. It is a time for thinking and waiting. The poppies are bright amidst the day which could be endless if you let it. I look out the window and wonder what it all means. That’s what I felt when I saw her. it must be agonising to lose one’s voice. A horrible kind of torture. I feel so sad thinking about it. I agree with Patti, that sentence struck a chord. Perhaps the way you feel about her enjoying Wuthering Heights is because it makes her human when you know first hand how inhumane she’s been to her own flesh and blood? Hard to come to terms with that I’d think. You are spot on with that one, Cathy. It just unsettled me a bit. I mean, she can like what she likes, of course, but it was unexpected she chose that book. I wasn’t prepared for that! What a beautiful image. I love poppies, especially red ones. So sad that it came to this for your friend and her mom. But it happens all the time, doesn’t it? So much time wasted, all for naught. I dislike Wuthering Heights for many reasons. But as Cath says above, probably a reason for that being a book of choice for them. Poppies are very cheery and I do love them but it was weird to see them everywhere yesterday. Maybe I was just hyper-aware and noticing them more! Beautifully written. It seems from what you have written that you and your friend are learning more about your friends Mother. Maybe it was all meant to be. That is a gorgeous quote, Mags, and oh, so true. Thank you for presenting that perspective – I think it is probably meant to be too. We are all going to learn something from this! I love Wuthering Heights and I know what you mean about being uncomfortable knowing your friend’s mother also loves it – illness is often a time for some thought readjustment from everyone involved. Lovely post Selma – wishing your friend’s mother all the best for a speedy recovery. You are so right, Gabe. Illness does make you reassess things. It certainly hammers home how important our health is as well as how important it is not to let conflict escalate into something that goes on for years and years. What is the point of that? Life is too wonderful to be wasted on negative thinking. My sister had a stroke back in 1995 (she was 27) and lost her ability to speak/understand to the degree she did. Over time she improved (and did have a happy ending, I assure you – she married and moved to England), but I’ll never forget the shock of seeing that taken away from her. My pithy, ascerbic, funny, smartass sister. We lost that aspect of her forever, and so I can fully understand the things that are tearing at Jules right now. Anyway, I think the poppies are a gift. What else would these sprightly shocks of colour be, waving about in the breeze wherever you seem to go? Poppies are happy – their petals seemingly delicate but atop those strong stems, reaching tall. I’m inclined to tell you to enjoy them, but I expect you are. WOW. That is young to have a stroke. I am so glad she improved but it must have been such a shock to all of you to see her like that. I think the poppies are a gift too. They are so cheery and strong and delicate at the same time. I feel better every time I see them! Wishing you and your friend all my best thoughts in this time of thinking and waiting. Take care. Thank you, Tracey. That is so kind of you. It’s strange that we are hard-wired to look for meaning and mostly find none. The beautifully evocative details in your post are a testament to your talent as a writer, Selma. It’s true. We do look for meaning but often the message is to just be. And see. And that is enough. I really appreciate your kind feedback. Lovely post, Selma. I think, sharing the love of a book could make you uncomfortable with getting too close to Jules’ mother. My heart goes out to the three of you in this painful time.. Thank you, Adeeyoyo. So kind of you. Thanks, Val. That means a lot to me because I love your writing too. Now I am intrigued. But please do call on me anytime! As you probably know, poppies are at their most prolific when the ground has been disturbed … they were the first flowers to appear when the First World War trenches of Flanders ceased to be used. So, it was adopted as a symbol by the Royal British Legion, as a token of remembrance. So, maybe they could be taken of a symbol of a new beginning? I think that is a great way of looking at it. I didn’t know that was why they were adopted as a symbol. You know so much about all that stuff. It’s kind of uplifting that they appeared after war like that. How nice! I know The Waiting all too well. It was horrible watching Gramma Ev slowly pass away before my eyes. We read to her, we sang to her, we told her stories, brushed her hair, and held her hand. It was beautifully painful. Awww, Meleah. I know. It is so hard. I cannot imagine how painful it must have been for you. Your gorgeous Gramma Ev. She was just such an extraordinary person. Beautifully painful is exactly how it is…. Awwww. Now you’ve made me cry. Your point about looking around your home trying to find the little girl you were has really tugged at my heartstrings. Oh, that is so sad. I know what you mean. It is so hard to lose those we love. I love poppies, and while their meanings are varied, if they bring cheer and hope, then that is the meaning they have for you. Still sending strength and love to you and your dear Jules. Awww, Karen, you are so good at summing things up. Jules is the key. It’s all about her as far as I’m concerned. Thank you for all your good vibes and prayers. I can feel them coming through.